We had 6 adults and four children and two small dogs, and there was plenty of room for everyone! The house was really nicely done, and very clean. The balcony is right over the beach. Port A Escapes is super easy to work with, too. Thank ya'll for a great vacation! 3 days @ Port A! We found Lost Colony to be a wonderful place. We loved our rental and will be coming back next year. The only "complaint" is the bottom bedroom does not get cool enough. If it were me, I would put a window unit or small air conditioner in there. We had 8 adults and 2 children and a dog and loved every other thing about the stay!!!!! Very relaxing time. Always enjoy the great location. We'll be back again soon. We had a wonderful time at this location primarily for the view, night and day, moonrise to sun rise to sunset. The deck is fabulous, the seating is fantastic. Sliding glass doors would be better than the existing but not a major issue. The sleeping arrangement was adequate due to the large sofa, mainly because the photos were slightly misleading in that it looked as if there was enough for 3 couples and a single adult, but there is only 3 large beds. However, the 3 singles were great for the kids. The bathrooms were adequate, but towels were great. The owner should consider putting a powder room or even another full bath on first floor, as climbing up to levels of stairs to use the facilities is pretty taxing, especially at night. The kitchen is very nice, with everything needed to cook meals. Overall the house is nice, but mainly you get your money's worth on location. Beautiful night views of moon and night skies, close to beach. Thanks for a wonderful vacation. We took our family vacation in Port A this year and was pleasantly surprised. The property was semi-private and had everything needed for our 4 day stay. The views were beautiful. We had a few minor maintenance issues but they were resolved within the day. We cant wait to go back! Me and my family stayed in waters edge and tita's SandCastle from Aug4-7 we had so much fun. We absolutely loved both these homes, they were both kept very clean and the views were amazing. The only issue was the stairs. If you have anyone that issues climbing stairs then these homes are not for you. Other than that we loved it! We had a family vacation. Kids, spouses and grandkids. We had a great time. The Water's Edge 6LC was great. Very nice and clean. Easy access to the beach. Quite surroundings. We would definitely stay here again and highly recommend it to anyone, of course that means it may be harder for us to reserve it for the next trip. The Port Aransas Escapes staff was great, helpful and very friendly. Great job. The house was clean and stocked with everything we needed for the 5 night stay. We hope we get to make it back here one day. Overall was a great house. Best part was being so close to the beach and pool. A little far from town, definitely recommend bringing majority of your meals (unless your planning to do activities in town also) wish the master bedrooms had their own bathrooms but it worked out! Also wish they had left us with more than 2 extra trash bags for the whole house. Another plus was the view from both masters and the common areas there was a perfect view of the ocean. Great place to stay. Portaescapes always maintains their rentals very neat and clean. This rental property was clean, well stocked, and the location was perfect. Loved it!! We are glad to hear you enjoyed your home along with its great location. Just give us a call when you are ready to come back to Port A. We had a fabulous time at our stay! Couldn't ask for a better vacation! We are glad to hear that you had a great time. Just give us a call when you are ready to come back and do it again. We had a group of 10 stay at this location for Labor Day 2015 and couldn't have had a better experience. The house is spacious and very well finished, and has the best access to the beach you could ask for. We hope to be back to stay here again! We are glad to hear your group enjoyed your house along with its location. Just give us a call when you are ready to come back and do it again. Everyone had a fantastic time at this great home-it being so close to the beach and pool. The beach is mostly families and very clean. I only wished that it had one more bathroom for all of us. We have decided that we will come back again next summer. Fantastic stay!!! Loved this place!!! the bathroom. There are beds for seven in the bedrooms. There is an outside shower which will be great in the summer. We have booked for a week in June this year. As so relaxing. We loved being so close to he beach.! I decided to rent this house 6 months prior...Sylvia was my agent...she was incrediable!!! When I met her 3 months prior to my 18 day stay, it was like seeing an old friend. Perfection!!! I visited the home then before the was nice and I was comfortable with paying the balance at that time. When my family and I arrived on 27 Jun it was a entire new home...furniture, flooring, deck, kitchen, and a added room that now made it a 4 bedroom. The pictures online are exactly the same as what you get...open floor plan, great kitchen, fabulous deck and as close to the beach as possible...we overpacked...everything but food was there for us!!! We had a fantastic stay and will be back! Maid service and maintenance team was excellent. 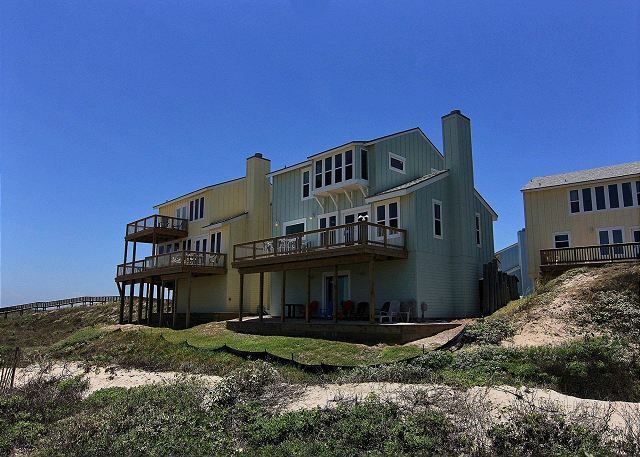 This is a great find for the young and told by the grounds keeper, it is the second closest home to the beach in Port Aransas. Rent it now before it's too late. Wonderful vacation spot. This was our 5th or 6th year at Lost Colony and this proerty was the best. Recently updated it was very comfortable. Really enjoyed a Birthday Dinner on the balcony overlooking the beach. Staff and construction crew on the grounds were very cordial and helpful. The only thing i would have changed would be a masterbath. Wonderful views from the balcony. Beautiful, clean and modern home. There was a mix up initially with the dates but was resolved with the owner agreeing to come in a day late. The initial response I received from your business was "I did not make the reservation" when it should have been "I'm sorry, we will see how we can best accommodate you and your party". In the end all was well and will stay there again. The best thing about this place is location and pet friendly. Yes there are some recent renovations to inside and outside but still work to do on both. Need to add a bed as it was advertised as sleeping 10 and there was only 9 beds. Also could use a new broom and maybe a mop. The new refrigerator's ice-maker was not hooked up but management brought us a bag of ice. This property has so much potential and we have stayed here for the last 3 Sandfest so it really is a nice place just needs a few small things to top it off. On the upside, the location - on the beach and close enough to restaurants, etc - was great and the layout of the home was neat and furniture/dishes/etc were clean. On the downside, the main room floor had considerable warping, the garage was pretty dirty/dangerous (relevant as that's where the supposed stash of beach toys were said to be located but were not found amongst the old furniture, etc), and some of the glasses were chipped/unsafe for drinking (and the A/C couldn't be dialed down below 72) --- none of which was a big deal and didn't keep us from having an overall positive experience, but not quite what you'd expect for ~$700/night. We all had a Great time! Everyone was very comfortable, everything you needed and more was provided. We brought more with us than we needed to have but this was our first time to stay in a rental home. Couldn't have gotten a closer spot to the ocean unless you were in it! The balcony and swing were my favorites. Coffee in the AM watching and listening to the ocean and birds, also saw dolphins, wish we could do that everyday. Absolutely loved our experience, so thankful our family could get together and enjoy it, would definitely recommend to anyone and hope to make this a yearly family excursion!! Fabulous location. The property is in need of some TLC as age along w/ wear and tear is evident. Location is by far the best thing about this place. Really needs to be updated but is clean and the kitchen was better stocked than last year. It was a fun place to stay. We loved the area. In the future we will use Port A Escapes again. The unit is showing wear and there were empty cans and trash outside. Had a blast! But you can tell that the property has been around for a while and is experiencing some wear and tear. Also, more trash bags + cleaning supplies (in general) would be nice items for them to stock for guests to clean before leaving. Great Location! Nice large family area and deck. Kitchen was adiquite to cook a big dinner. We had six adults 4 children and a pet. No broom, dust mop or any sort of cleaning equipment was provided to help us with the sand draged by children. Deck chair fell apart when we sat down - had to put in garage so kids wouldn't get hurt. Over all we had a great time. We've stayed at this same condo for the last 3 years. Our overall stay was good, but the condo's kitchen seemed poorly stocked this year. Cooking utensils and coffee cups in particular were scarce. We were disappointed to have no coffee filters, and felt there wasn't enough toilet paper, or paper towels in comparison to our last two years here. We will definitely be keeping an eye on reviews before we rent this unit again. Probably one of the best Port A vacations I have ever had. Fantastic location about five miles south of PA. This unit (#6) and three others (#5 and two others - I don’t recall which) on this property are practically right on the beach, but you have to access the beach via a boardwalk on the opposite side of the adjacent house. Not a huge deal – a minor inconvenience. Incredible views of the ocean from the balcony, kitchen, living area and a couple of the upstairs bedrooms. Sunrise is at the back of the house so be prepared for an early rise. Nice swinging bench below the balcony where you can sit and enjoy the view of the ocean. I was happy with the reservation process, payment schedule (relatively small deposit and the balance at check in), office staff, etc. The cleaning fee is well worth it with the sand, etc. from the beach. The house comes stocked with most basic kitchen needs (pots, pans, plates, cups, utensils, toaster, coffee maker, microwave, towels, etc.). Don’t forget your coffee/filters, salt/pepper, laundry detergent, extra tp, soap/shampoo, etc. There is a full size washer and dryer. We comfortably fit six adults, three teens and a baby in the house. All bedrooms are upstairs. One bedroom has three twins, another has two twins and an extra mattress that can be pulled out, and the other has a double – so you can sleep eight upstairs. I think that the huge sectional sofa has a hide-a-bed, so you could probably sleep three or four in the living area. There are two small full baths (upstairs has a tub/shower and downstairs is just a shower). Let's face it - the salt, sand and wind take a toll on beach houses - and this one is no exception. The garage door was about to fall off of its rollers (literally) and there were some places in the living room floor that were buckling. Not huge detractors, I know I’m nit-picking. Lots of the owner’s stuff in the garage, but still lots of extra room to keep beach toys, chairs, etc. I’d stay again! Wonderful view and very comfortable accomadiations. I would recomended it to friends and family. Don't have time to!!! But was a pleasurable experience and would go back. A beautiful location. However for the cost, the home could at least provide some hot pads, potato peeler,baking sheet and a handle on the refrigerator that stays on. The slididng bathroom door is pitiful, as it sticks and won't close all the way. A little money needs to be spent on this place. Location - right on the water - couldn't have been more perfect. Wonderful deck overlooking the water. Wish there had been more lounge chairs on the deck. We were always competing for the one lounge chair. Living area was very comfortable. Dishes in the kitchen were fun and in sufficient number but some pans need to be added. We tried to use a sheet pan and quickly discovered that the bottom was rusted through. Parking is a little crammed; couldn't have accommodated more than the 2 vehicles we had. Rate was a little pricey for the condition but acceptable due to the location. The management company had indicated that the unit was LIKELY to be ready before the set 4:00pm check-in time but it was barely ready by 4. That is a little late for check-in so that was a disappointment. Hope to be able to return soon! Patrick from Port A Escapes was super accommodating. While we were there, a large storm blew through and knocked out the power to the whole complex! Another house was hit by lightning! The power was only off for a few hours and the fine folk at Port A Escapes were easy to reach on the phone and jumped all over the power problem immediately and in a very professional manner. No one was hurt. This house was perfect for my large group of friends, and we are already planning to return. This rental had such a great view and location that it was easy for us to overlook the flaws mentioned in other reviews. I can verify that some of the problems have been addressed. There is a new fridge, there are now blinds in the living room/kitchen, there is a toaster and there is a small grill in the garage. It was a bit pricy but our family enjoyed it so much that to me it was worth the splurge. and cracked up plastic stuff for making sandcastles. Was it worth the high price, perhaps. Will I do it again, perhaps, but I think for the price, something larger could be obtained. If there are 6-8 of you in your group, this is the perfect size for you. use some fresh paint, and the faux wooden floor in the living room is bubbling up in places. There are no blinds or curtains in the living room, so if you sleep on the pull out bed, be prepared to be up early when the sun pours in the large sliding windows. The furniture was comfortable with a nice pit couch, and several tables to eat and play games. Overall, a great experience. A great vacation spot for children young and old. We loved being right on the beach. The location was great! and the furniture was very nice. Biggest complaint is that the kitchen and baths were very dated, there was black on inside of drawers that stuck when you opened them and water leaking from the bottom of the tub. The kitchen was haphazard in how it was set up and there were only two decent coffee cups. Although it sleeps 10, there were not 10 sets of towels that I could find. The quality inside was disappointing. needs new refrigerator very badly. sliding patio door very difficult to operate. sliding door for upstairs bathroom very difficult to operate. need of pull strings to operate. our old ones there. Need a toaster. left the ones we bought. told we could come earlier. We were tired, hot, hungry!! 4pm is too late a start; 2pm is reasonable; 10 am checkout is also oK; most are anxious to get up and out. Last but not least, Cost is too high! We loved the location and cleanliness of the property! Few things that were missing that would have been helpful and have been at your properties in the past were: a large trash can, broom and dust pan, and small grill. Had a great time. Location and view can't be beat and the Port A Escapes people were great. The house had a few cosmetic flaws (rusty garage and fridge) and some sliding doors that were really hard to open and close, but other than that the house was really nice and everything was very clean and neat. I will definitely try to rent this house again next time I go to Port A.